Great stethoscope for general use. It’s hard to fault the Littmann Classic II. 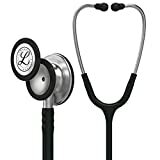 This is the stethoscope that many medical students and doctors choose at the beginning of their careers due to its balance of budget friendly pricepoint and high quality – but many stick with it for a lifetime. The chestpiece is two-sided with both a diaphragm and traditional bell, although the diaphragm is tunable (meaning it’s easily able to capture both high and low frequency sounds) if you’re too hurried to turn it over. The thing that really sets Littmann products apart for us is the high quality stainless steel chestpiece, which gives you a sound quality that you really can’t duplicate with a cheaper product. Earpieces are soft, comfortable and easy to replace yourself. They have patented technology designed to form an acoustic seal giving you a much better sound quality. They are anatomically angled and adjustable so that you can personalise your stethoscope for optimal auscultation. One feature of the Littmann Classic II which patients appreciate is the plastic (‘non-chill’) rim on both bell and diaphragm. 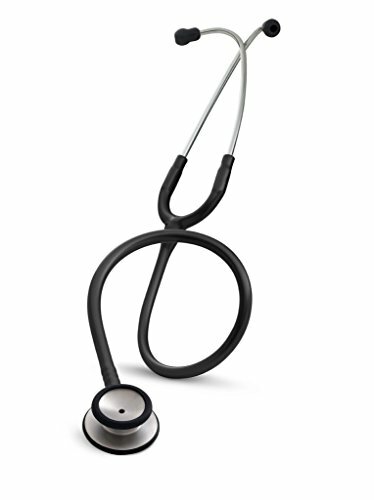 Older stethoscopes (and those without this feature) can feel excessively cool on the patient’s skin – the non-chill rim helps to avoid this unpleasant sensation. We also love the range of colours available, including the traditional black, grey and navy blue. For something brighter, you could choose the Littmann II Classic in ceil blue, raspberry or even pearl pink. This is a hard-wearing piece of kit. It’s not uncommon for these to last a decade, even with heavy use. The tubing is very sturdy and resists years on end of being folded up and stuffed in scrub pockets. The plastic is specially designed to be resistant to alcohol and skin oils, and is phthalate and latex free for those clinicians who suffer latex allergy. At 135g, this is the lightest of all the Littmann stethoscopes. 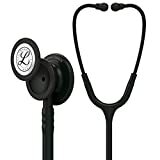 The Littmann Classic II is a single-lumen stethoscope (as opposed to dual), suitable for most learners and generalists. If you’re looking for a more high-performance stethoscope, why not check out our other stethoscope reviews?